Thanksgiving Day in the U.S. is already long gone and finished but who cares anyway since this is already a year late anyway. This was the version I had right after I saw the printed disaster of a joke I submitted days before and the funny thing is I had another version in mind right after I finished this, which still shows the big "WHAT?!" 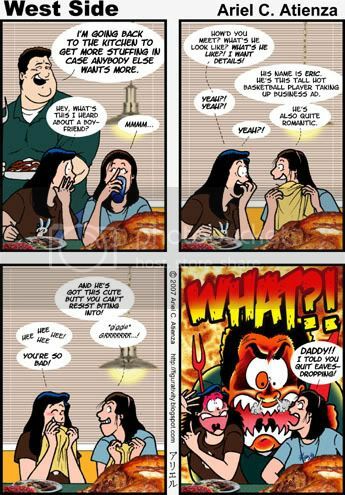 in the last panel but is implied coming off panel in the kitchen and Mare shouting at her dad the same thing. Anyhoo, I still have one more Thanksgiving Day strip to revise and the Christmas strips are up next. * The original version of this strip was published Nov. 22, 2006.